The Born To Try singer, Delta Goodrem, may have invested in some cosmetic tweaks over the years. Dr. Haworth told Daily Mail Australia on Monday he has a ‘strong hunch’ that Delta may have undergone a rhinoplasty, and may have also had filler injected into her cheeks and lips. The Beverly Hills plastic surgeon believes the tip of her nose is likely evidence that she has had cosmetic surgery. Dr. Haworth claimed: ‘Certain angles maybe more revealing than others, but I have a strong hunch she had undergone a rhinoplasty or nose job in the past because the shape of her tip is more demarcated from the rest of her nose while her bridge is noticeably narrowed.’ He also believes she may have indulged in some other non-surgical cosmetic procedures. ‘I find it apparent that both her cheekbones and her lips have been enhanced with a temporary filler, most likely of a hyaluronic acid variety such as Juvéderm or Restylane’ he told Daily Mail Australia. 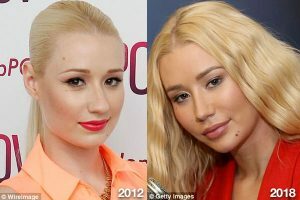 Has Iggy Azalea Transformed Her Face? Dr. Randal Haworth, told Daily Mail Australia on Tuesday that he believes the rapper, could have made additional changes to her facial shape. Haworth, who has not treated Iggy himself, stated that the Australian musician appears to have invested in some ‘subtle‘ and ‘beautiful’ refinements. ‘Iggy is what I would describe as an excellent “canvas” on which a plastic surgeon can reveal his work,’ he says. Iggy Azalea’s striking appearance may be the result of further cosmetic procedures, according to Dr. Haworth. As one of the leading rhinoplasty specialists in the United States, Dr. Randal Haworth continues to challenge himself to be the best he can be. By constantly questioning his results and asking himself how he can do things better, he feels he is subjecting himself to the highest quality assurance and delivering the best possible outcomes in plastic surgery . Performing rhinoplasties are one of my favorite specialty since the nose place such a central role in the total harmony of the face. Consider it like one of the leading instruments in the orchestra. Though most plastic surgeons and patients alike obsess on nasal humps, wide bones as well as drooping, boxy, pinched and ill-defined tips and, of course, the width of the nostrils, little attention is paid to the actual shape of the nostrils. In other words, a surgeon should not only assess whether the nostrils are wide at their base, but also whether they are arched, pointy, thick or sigmoid in shape. One of the most common and unflattering nostril shape is that of the “samurai nostril”. Look at the following two photographs and you will see what I mean. There are a few ways to correct this but probably the most reliable is to harvest a “composite” graft from the hidden portion of one’s ear. This detailed surgery involves insinuating this graft between an incision made on the inside of the nose, corresponding to the actual width of the retracted portion of the nostril. This graft is then sutured into place with the skin side facing the actual inside of the nostril to maintain the continuity of it’s lining. One can lower the nostril about 3 to 4 mm with this technique. Of course, some resorption of the graft occurs so it is best to over-correct this. Other techniques involve strategic V-Y plasties, which are essentially internal tissue rearrangements of the inner aspect of the nostril in order to lower its rim, cartilage grafts in the actual substance of the nostril to help correct pinched tips while lowering the rim and, finally, filler. These latter techniques, though successful to some degree, are not as effective as an ear “composite” graft. Note the following two cases in which “composite” grafts were taken from the ear and placed within the nostril to lower them. Of note, simultaneous upper lip lifts to further enhance a feminine appearance were performed.